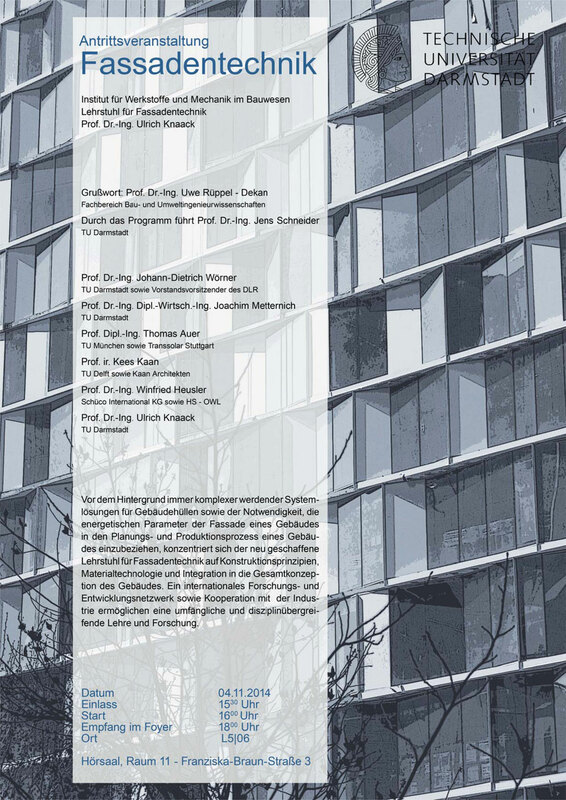 In reflection of the technology developments a new chair façade technology is established at the TU Darmstadt / Faculty of Civil Engineering – to develop education and investigate technologies, materials and functions. To celebrate this and to give an impulse a kickoff event at 04. of November 2014 is organized, starting at 15.30 with lectures form Prof. Dr Johann-Dietrich Wörner / TU Darmstadt, Prof Dr. Joachim Metternich / TU Darmstadt, Prof Thomas Auer / TU München + Transsolar Stuttgart, Prof Kees Kaan / TU Delft + Kaan Architects and Prof. Dr. Winfried Heusler / HS OWL + Schüco. Ulrich Knaack will closed the session with some words about his plans for Darmstadt.